Water Heater Services - About Our San Jose Plumbing Services | Cupertino Plumbing, Inc.
Indoor hot water is a luxury that most of us overlook and take for granted until it’s gone. You can imagine how much more uncomfortable and inconvenient life would be without hot water, so it’s important that you take a more active role with your water heater. Cupertino Plumbing is here for all of your water heater needs, including water heater installation, service, and repair. We do everything we can to ensure that our customers continue to enjoy the luxury of indoor hot water. The average life expectancy of a water heater is between 10 and 12 years. However, the exact lifespan of your water heater will vary depending on a number of independent factors such as the quality of installation, the level of maintenance, and your home’s water quality. Because age alone is not the only determining factor, look for these signs as indications that it’s time to replace your water heater. When the time comes to buy a new water heater, you have two options: tankless or traditional (tank-style) water heater. Both types of water heaters have their own pros and cons, so it’s important to research your options and speak with your San Jose plumber to make the best choice for your household. To help you get started, here’s a look at the pros and cons of replacing your tank-style water heater with a tankless unit. 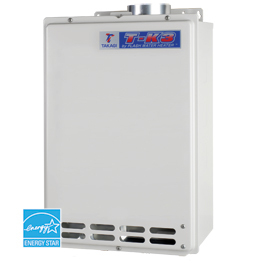 Pros: Tankless water heaters have a lot of advantages. For starters, tankless heaters eliminate the standby energy losses of a conventional tank, which means more energy savings each year. According to the U.S. Department of Energy, gas-fired tankless water heaters save an average of $108 in energy costs per year. Tankless water heaters also provide an endless supply of hot water as needed, which means no more waiting for the water to heat up in the tank and no more fear of unexpectedly running out of hot water. Cons: One of the biggest drawbacks of tankless water heaters is the initial cost. Tankless water heaters can cost up to three times more than storage heaters, including professional installation by a qualified plumber. You may also need to purchase multiple water heaters depending on the size of your home and your household’s daily hot water usage. For all your water heater needs, trust Cupertino Plumbing. Our team has more than 50 years of combined experience and can handle any tasks associated with water heater maintenance, repair, and replacement. Contact us online or call us at (408) 335-0617 to request your free estimate on water heater service or installation in San Jose. Whether it is installation, replacement, or repair, our San Jose plumbers can provide you with water heater services you need. Please do not hesitate to contact us today to learn more about our water heater services!